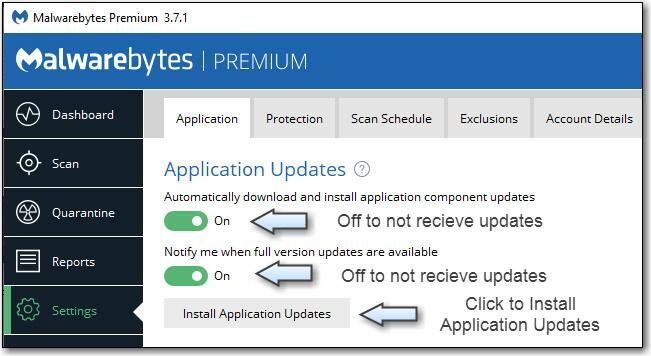 If the system in question has the Malwarebytes 3 settings at default, that 3.6.1.2711-1.0.527 software is queued for an update to 3.7.1.2839-1.0.538 as per the release announcement in the sticky at the top of this sub-forum. If you wish to hasten that update process, you might open the MB3 GUI > Settings > Application Tab > Application Updates > Install Application Updates button. So what your saying is 3.7.1.2839-1.0.538 is no longer Beta and an official update and recommend updating to it? I have my auto AC Updates switched off on my main drive but enabled on my HDD. I will be doing manual updates on SSD from now on and use my HDD as a test mule. Yes. Absolutely. It is now termed a release version. I am still going smoothly on 1.0.527 with CP update turned off, i have never had a smoother experience than this for a long time. My PC does not hard freeze up any more. My PC shuts down without that waiting for program to close message. I am not willing to risk a change just yet so i will be staying on 1.0.527 and see what happens. I'm sorry to hear you're still having issues and completely understand your frustration. If you'd like to revisit troubleshooting, let us know and we can take a closer look at the issue. Still running without freezes, since January!. Once I had periodic BSOD (weekly or so...) for six month. It was WinXP, so I thought it is "normal". Then I upgrade memory, replacing all SIMS with new ones and BSOD was gone! I am still experiencing freezing after start-up even with the latest MB 3.7.1.2839 on at least four different Windows 7 PCs. On three of them removal and re-install so far worked (at least for the last few days) but on one of them the issue still occurs after a reinstall and disabling the web protection. This means I had to completely uninstall MB and wait till a definitive fix will be found. Somehow annoying as the first issues already occured since a few months. This is why I have not gone past the patch last issued. Can someone please tell me how to stop MWB from prompting me that there is a new update/do I want to install? I have had nothing but bliss since running the below version, my system is as smooth as silk. I too have learnt the hard way. 1.0.9608 << this is the only different version to yours. And Firefox has covered your prompt problem. I'm sorry to hear about your continued issue. Do you have Macrium, Acronis or similar backup software installed on the computers? All the PC (as well as some with Windows 10 which do not experience the issue) have Acronis 2019 installed. I will see whether it will be possible to re-install Malwarebytes and get the logs. Was there another update recently? My system started the same thing today, as last December, freezing. I disabled malware, and everything is working. Has anyone else started seeing this again? Unfortunately I have to agree... MBAM has not actually figured out everything they broke when they gave birth to this freeze symptom in Win7 systems late last year. Actually for me, BOTH OF MY TWO Win7 HTPC machines (running WMC, with extenders, and Ceton TV tuner card and Hauppauge TV tuner card) started freezing sometime after last summer, and I've been chasing the problem ever since. I assumed MBAM had fixed things when they said they did, but I don't think they fixed all of the more exotic configurations... like my HTPC's. After one of my two homebuilt ASUS-based HTPC machines died (from being hard powered-off/on after a freeze repeatedly too many times) I replaced it with a regular retail Lenovo M910t and transferred all of the internal HTPC guts over from the dead ASUS machine to the M910t. Worked freeze-free for a few days, until I got to the point of installing the Ceton and Hauppauge drivers and related software, i.e. finally "activating" the HTPC hardware/software and starting to use WMC Bingo... freeze appeared, on the brand new machine. So it couldn't have been hardware failing, and I didn't even do the underlying Win7 install. I only installed MBAM (as I always did), and then enabled HTPC functionality. So now I had seen the freeze on THREE different HTPC/WMC machines, all of wich contained Ceton and Hauppauge TV tuner cards inside, all of which also used MBAM Premium, Macrium Reflect Home, NovaBACKUP, and Aida64 (plus DUMeter and PERFMON). I tried all kinds of hardware/software swaps, removal, replacement, de-configure, etc., all to no avail. Still the freeze was there. So I chased the freeze unsuccessfully on all three machines for what turned out to be 8 months... until last Wednesday (one week ago today) I made a breakthrough. Last Wednesday I uninstalled only MBAM (leaving everything else just as it was). I also uninstalled Microsoft Security Essentials, which together with MBAM I had been running as my "protection" for almost a decade without problems, until sometime after last summer. In place of MSE and MBAM I installed Bitdefender Total Security 2019 which had received highest marks from many online review sites. Sure enough... PERFECTION!!! Both of my HTPC machines have now remained up solid 24/7 and freeze-free since last Wednesday! That's 7 days straight, of uninteruupted freeze-free performance. So far no complaints about Bitdefender which seems to do what it's supposed to, and is not intrusive. MBAM was the culprit, at least on all three of my win7 desktop HTPC machines. However it continues to operate problem-free on 12 other Win7 machines I maintain remotely for friends and family, as well as on 3 Win8.1 machines and 6 Win10 machines, none of which are Win7 HTPC machines of course. So after 10 years on my own three Win7 desktop HTPC machines, MBAM + MSE is out, and Bitdefender is in. And once again I have freeze-free 24/7 continuous uninterrupted operation. Sorry to hear of your issue. To help investigate this further, please carry out steps 4 and 5 in the topic linked below and provide the generated log file.